Does it get any better than this? 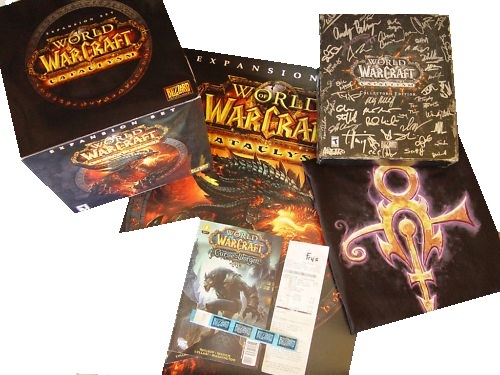 Here is a BadassToysforBadassBoys EXCLUSIVE World of Warcraft developer team signed Cataclysm Limited Collector Bundle! -WOW Cataclysm poster available only at the release party. -BLIZZARD line placeholder wristband which functions as a Certificate of Authenticity, providing unique wristband number. Wristband is still flattened and was NOT placed around wrist! This is truly a one-of-a-kind World of Warcraft supreme collector's piece. There is other signed copies for sale in the market, but we have seen NONE that also include the original Fry's receipt AND wristband placeholder from BLIZZARD! Add in all these pieces, and this collector bundle will rank in the top 1%(if not THEE #1) in the standard world market without question!